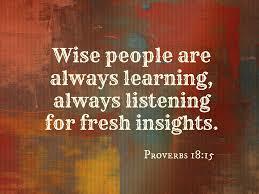 I love that wisdom isn’t a destination to reach, but an ongoing and deeply rewarding process. Whether we see evidence of this growth in the development of a new skill or in the excitement of suddenly discovering a new solution to an old problem, God graciously continues to cultivate our minds and abilities. It’s a gift we’re never too old to receive! We should be committed lifelong learners, treating life like a university—and showing up for class every single day! A natural companion of lifelong learning is curiosity. Curiosity is often the art of asking a good question that reveals an answer! Curiosity can transform boring work into something exciting. Curiosity is the tool that sparks creativity. Curiosity is the first step to creating empathy. To care about someone you must first wonder about them! Curiosity will empower you to come up with ideas, take action, and move things forward. Jesus displayed curiosity by asking an abundance of questions, such as “You of little faith, why are you afraid?” (Matthew 8:26), “Who do you say I am?” (Matthew 6:14-15), and “Woman, why are you crying? Who is it you are looking for?” (John 20:15). Although He already knew the answers, He was curious about their thought process and encouraged those around Him to think. So don’t grow stagnant and set in your ways. Don’t assume you already know it all. Reignite your interest in the world around you, design and ask curious questions, be wide-eyed and eager to learn. Allow curiosity to swing wide open the doors of opportunity in your life, you never know where your question will lead! !